I can't thank Tonya enough for all her help closing the purchase of the vending machine I purchased. Tonya, you were absolutely fabulous... From Start to Finish you made sure you covered every detail. Tonya, you were absolutely fabulous in what could have been a stressful situation. You followed up and made sure things when smoothly. Of course, I would give you a glowing reference and let others know, Customer Service was at an all time high. From Start to Finish you made sure you covered every detail. MEGA Vending made everything simple for us. We are a small company and found it hard to find vending options for our office. However, MEGA Vending made everything simple for us. From inquiry through installation, MEGA Vending assisted us every step of the way. Thanks! Honestly, we are very, very happy working with this company across the board. Future potential customers- We were shopping for two new vending machines which would be the combo style. Candy/chips and drinks type. We did decide on a specific model and shopped around to see which companies carried this model and the pricing. We did find Â€ Megavending Â€ which was the best company to work with. Exceptional service immediately with the person on the phone, placing the order, planning the delivery to the delivery itself. Honestly, we are very, very happy working with this company across the board. I would highly recommend Â€ Megavending Â€ to any office/company searching for any type of vending machine. We are truly happy to work with them and will definitely seek them in our future for any other needs. If one word can describe MegaVending its "Professionalism". Outstanding customer serivice! Great communication skills! Outstanding customer serivice! Great communication skills! April Hurd was able to help me 100% with all my concerns about the product I purchased today. I couldn't be happier with my experience over all. What an amazing job, April! Thanks for all your help. All my future orders will be with you. You have been excellent handling my order like true professionals. Your customer service has been wonderful and blows away what I have dealt with on other sites. Your response time has been great too. All my future orders will be with you. In the future I would use this site again. I would like to thank Melissa for helping me with the sale. In the future I would use this site again. He was aware of our needs and made sure we received what we needed. Stacey Sweet was so helpful. We are a real estate office and this was our first experience in obtaining a vending machine. He was aware of our needs and made sure we received what we needed. Our office is planning a move to a larger location in the spring and we will make sure we contact him for all our needs. ...a great new vending location. Stacy Sweet did a great job by working with me on a great new vending location. I am so happy - USEDVending.com sold all 5 of my Office Deli machines!! I am so happy -- Used Vending.com sold all 5 of my Office Deli machines!! I worked with both Melissa and Calice I wouldn't be happier with the experience -- they were both a joy to work with. She was polite, knowledgeable and helpful. Amanda Haynes was wonderful! She was polite, knowledgeable and helpful. Amanda helped make my first vending machine buying experience a smooth one. I recommend this company for anyone interested in vending. The sale of my machine was very quick. The sale of my machine was very quick. Paperwork was explained well. M. Powers did a good job of putting buyer and seller together. Great experiences with 4 Vending. Very professional and I have landed 3 accounts thanks to their service. I have worked with Gini Sweet and she has been exceptional from day one. Thank you again for all your efforts. Great experience, great coordination in selling my product. Thank for your help Calice! Calice was very efficient and answered any questions that I had. The transaction went smoothly and I would use this company again. I found Used Vending on an internet search and thank God I did!! They were finally able to sell 2 of the 5 vending machines I was trying to sell! I sold them to a young man who seems quite eager to start his business. Thank you Melissa for all your help!! Now just sell my other 3!!! I will refer others to you! Most helpful, professional and friendly customer service experience I have had in years. Thanks for all your help, I will refer others to you! Vanessa and April have been very helpful in getting us set up with a vendor. Vanessa went over and above helping us out. I would recommend this company to anyone looking for vendors. I sold my machines through used vending.com. My experience with them was excellent. I am glad I could free my garage space. Thank you Melissa. Connie Jordan/MegaVending referred us to a real money-maker location. We depend on MegaVending for quality referrals to expand our vending business. Thanks Connie/MegaVending. We look forward to more referrals! We purchased our equipment back in 2007 through Mega Vending, April was our sales contact.2010 we decided to sell this same unit through their affiliate, Used Vending. We all know making the purchase is exciting but their are times when the sell can be more than challenging. This particular challenge was overcome by a sales representative that worked through the issue, communicated clearly, and resolved our issue. It takes an experienced staff and strong company to work through these challenges and ultimately make both parties happy. This is that kind of company. 4 vending the best. I highly recomend 4 vending, very professional company and the staff Melanie lee, April, super, very helpful. I will definitely use 4 vending in the future. Very good locations. 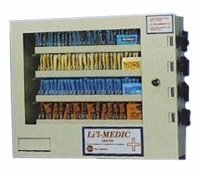 DLara vending. April was very helpful and especially nice and professional. She was able to answer all my questions quickly and accurately. She was a pleasure to work with and would not hestitate to call her again if I needed further assistance. Thanks April for a job extremely well done. I wish I knew about USEDvending.com back then! 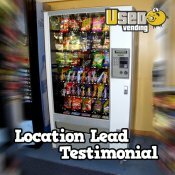 I recently sold four combo machines through USEDvending.com, and was very satisfied with the service Eric Normand provided. While I received substantially less for my equipment than I originally paid, that was more a function of being ripped off by (distibuting company name protected) when I originally bought them. I wish I knew about USEDvending.com back then! Eric was prompt in returning my calls, and most importantly sent the check when promised! At any rate, I would highly recommend USEDvending.com and Eric Normand to other sellers and also buyers too, who can get some outrageous deals. Don't be like me - avoid (distibuting company name protected) and other 1-800-RIPOFFVEND companies like the plague, and go with USEDvending.com instead.